A great indoor circuit in the Clydebank area of Glasgow that has race formats to suit all ages, abilities and budgets. Paintball and laser tag also available as stand alone activities or can be included in a multi activity package. A non-exclusive practice session (2 x 10-mins) driving single-engine go-Karts (minimum hieght 150cm). 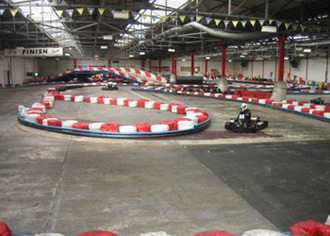 A whole range of go karting race formats are available for stag party groups to choose from to suit all budgets. Paintball and laser tag games can be included for extra fun and excitement.